Whether you just decided to give up disposable razors or if you’re just looking for a new brand to try, we’re here to help you find the best safety razor blades. We did a lot of research to put together this safety razor blade review by looking at some of the top sellers and best brands. But before we get started, let’s take a look at some of the features you need to know about safety blades before buying them. Fits Any Razor: All of our picks will fit into any standard sized safety razor. That gives you a lot of choices as to which one you want to use. It’s also nice that you don’t have to worry about sizing. 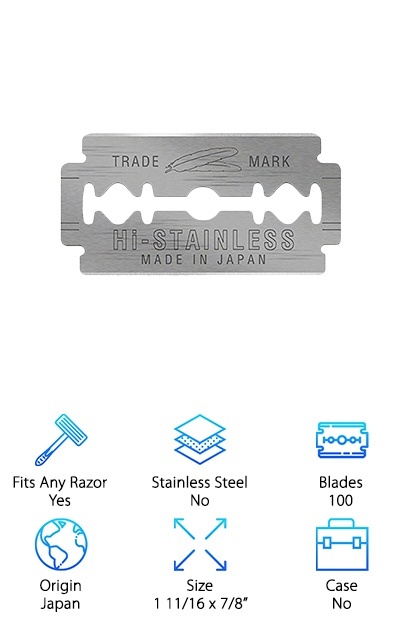 Stainless Steel: Stainless steel is a durable choice to make razors out of. While all of these razors have a stainless steel base, pay attention to the coating. That’s where you can see the differences between the brands. Blades: Most of these come in large economy sized packs of 100 razors. Large packs like this will last a really long time. In fact, depending on how often you shave, they could last more than a year. Origin: Razors like this are made all over the world and have been for decades. In fact, some of these companies have histories that go back centuries. You’ll find products from Japan, Russia, Turkey, Egypt, and the US here. Size: While there may be some slight, minuscule variations, these blades are all basically the same size: 1 11/6 x ?”. Think about it: they’re all designed to fit into the same razors. They have to be basically the same size. Case: None of our picks come with a case, per say, but they all do come in a protective box with the brand’s logo. Some of the razors are individually wrapped inside the packaging for even more protection. 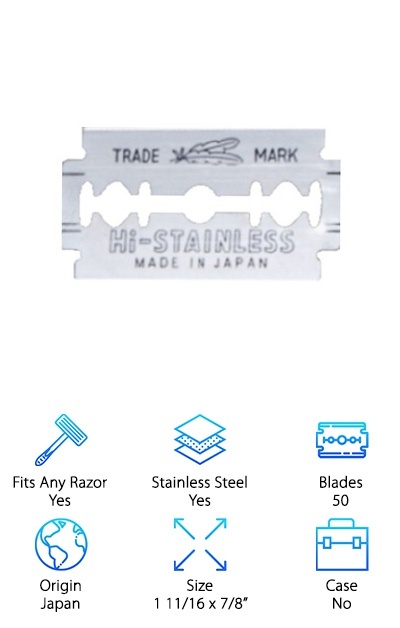 Now that you know a little more about the features to look for when deciding on a safety razor blade, we can move into our reviews. Here’s the deal: if you’re running short on time, check out the first 2 items on our list. These are our top and budget picks and will give you a good idea of what’s out there. The rest of our list is pretty sweet, too, so stick around if you can! Ok, let’s go! Our top pick for best razor blades for safety razors is from Feather. They’re made from stainless steel and then platinum coated to give you one of the best shaves you’ve ever had in your life. Why? These blades are flexible and have a nice edge that won’t tear up your skin. They’re also really reliable. Consistently sharp, high quality, and durable. What does that mean for you? A smooth shave and fewer blade replacements. Feather has been making these blades for more than 80 years, long before disposable razors were even a thing. They even make professional tools, too, so you know you’re getting exceptional quality. They’ll give you a much closer shave than any disposable can. One more thing: these are standard size and should fit into any safety razor. 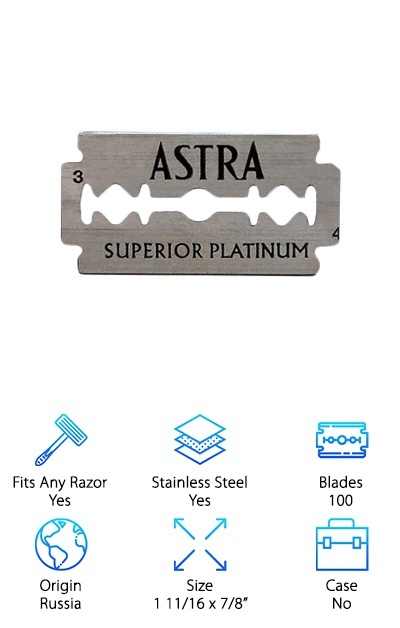 Astra razors are made in Russia and distributed around the world by Gillette, a well-known shaving brand in America. This pack of 100 is an economical way to get a close shave because they can fit in most standard safety razors. The stainless steel blade has a platinum coating that helps it glide smoothly across your skin. The coating also protects it from wear and helps it keep its sharp edge. The thing about these blades that made them really stand out to us is how they’re packaged. Each one is wrapped in an individual wax paper wrapper to protect the blades from moisture throughout the shipping process. It also prevents any damage to the blade. This pack of 100 comes in packages of 5 razors that are also individually sealed. 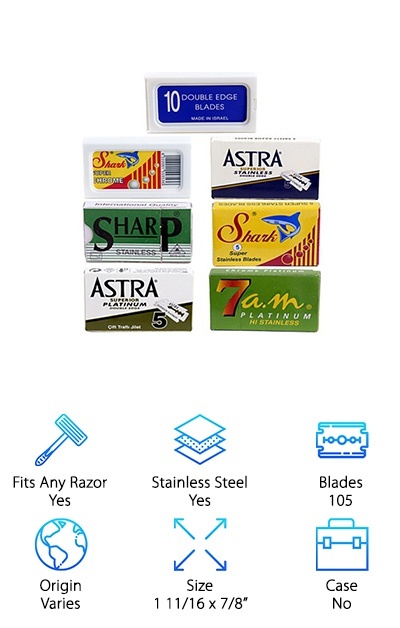 If you want the best safety razor blades for sensitive skin that are also designed for professionals, take a look at this. 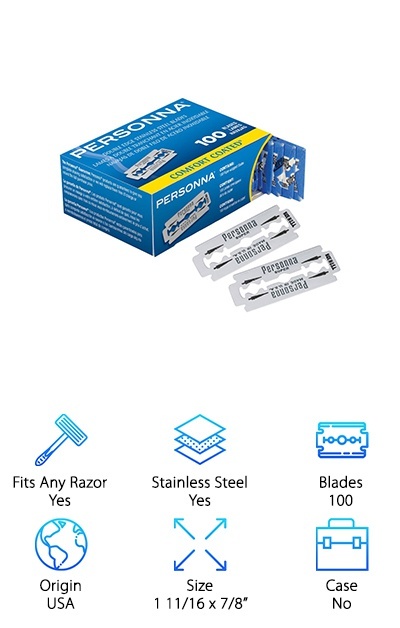 These Personna razors were actually designed with barbers in mind. They’re made of stainless steel and have the brand’s special Comfort-Coated edge. So, what makes them so good for sensitive skin? First of all, they are really sharp and can quickly cut your facial hair without causing damage or irritation to your skin. Plus, the Comfort-Coated edge helps it glide over your skin a little more smoothly. These razors can be used with any standard safety razor, too. Because of their stainless steel construction, they last a long time so this box of 100 will last a long time. In fact, depending on how often you shave, it could even last years. 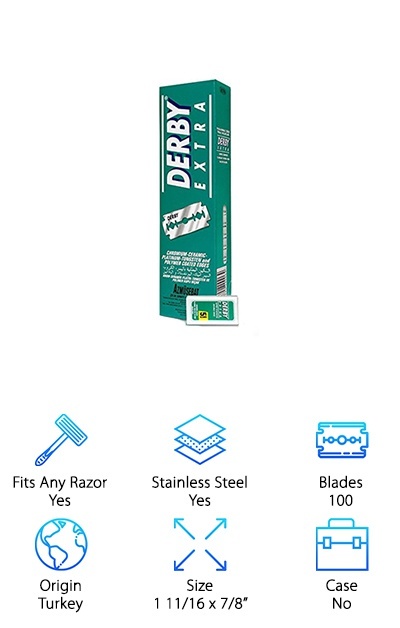 Derby Razor Blades are our next pick for best double edge safety razor blades. They’re made of stainless steel but what makes them stand out is the coating. While other blades have a platinum coating, these use platinum, chromium-ceramic, and tungsten. What does this mean for you? A close, smooth, irritation free shave. These blades are made in Turkey by a company called Azmusebat that has been focused on making high quality razors for more than 50 years. Today, they use proven techniques and combine them with modern technology. More specifically, they perforate, harden, and grind the blades using modern equipment. The result? A strong edge that stays sharp for a long time. When you take that into account, you can see how this 100 pack will last you a really long time. Learning how to shave with a safety razor after you’ve been using disposables for your whole life can be a little tricky. These are a great blade to start with to make the transition. They’re sharp but not the sharpest. What does that mean? They’re good to learn with because they aren’t too hard on your skin. That means fewer nicks and less irritation. 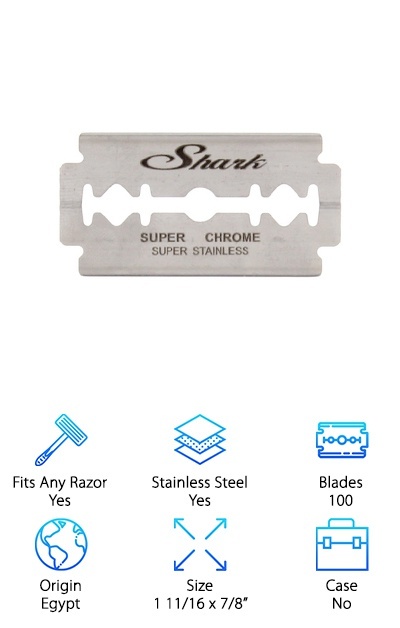 The stainless steel blades are polymer coated which helps them glide smoothly across your skin. They require a bit of extra care, too. Don’t wipe them dry because it could damage the polymer. Instead, simply shake them dry and you’ll get amazing results. Namely, they’ll keep their edge for longer than some comparable razors. If you take good care of them, they can last a full week even with daily shaving. What makes these some of the top safety razor blades is that Feather does whatever they need to do to make them as sharp as they can. In fact, we’d say that these are actually some of the sharpest blades available. They’re made of Hi-Stainless platinum which gives you a really smooth, close shave. There are meant for people who already have some experience with this type of shaving. They’re a pretty aggressive razor so if you’re looking for something that will take your shaving experience up a notch, give these ones a try. One more thing. They’re really durable and last a long time. What does that mean for you? This pack of 100 razors could last you years. They come in a long box that holds 20 smaller packages of 5 blades each. 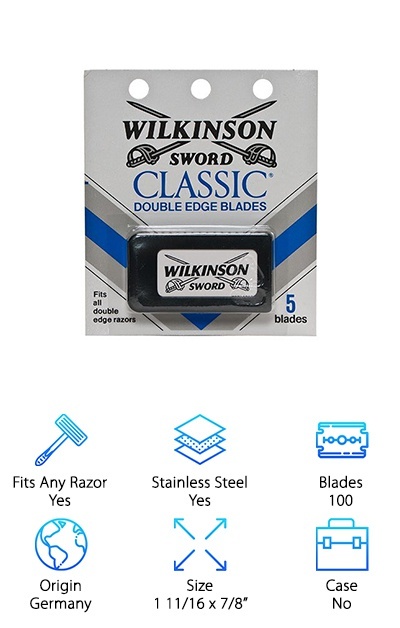 Wilkinson Sword Classic Blades are made of stainless steel that’s been coated in a triple layer of chromium, ceramic, and Teflon. Why? Each contributes something unique. Chromium resists corrosion, the ceramic coating increases durability, and Teflon helps the blade glide over your skin easily. These will fit into any standard safety razor and this pack of 100 will last quite a long time. They’re really durable, too. In fact, one razor can last up to 5 or 6 shaves so just imagine how long a pack of this many will last! Wilkinson Sword itself was established in 1772 but it wasn’t until 1962 that they started making razors. Considering they’ve had more than 50 years to perfect their craft, you can see how these razors came to be so special. 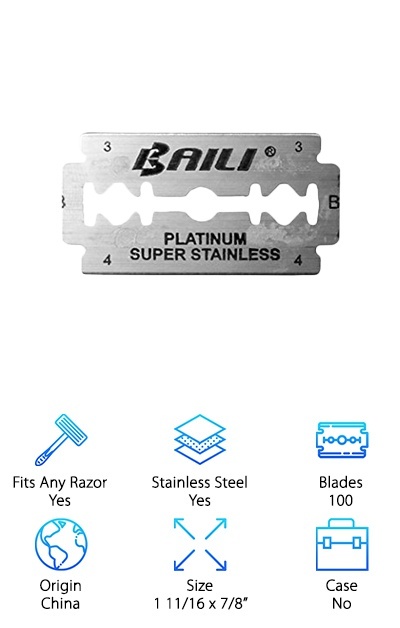 These blades from Baili are made of stainless steel with a platinum coating to make them more durable. They also keep their edge longer and give you a smooth, close shave. Get this: they’ll actually last about a week, sometimes 2 depending on how often you shave and how well you take care of them. And that’s not all. They’re compatible with any safety razor, just make sure they fit tight and you’re ready to go. This package contains 100 blades. They’re each individually wrapped to protect them from moisture or any damage during shipping. With this pack, you’re actually getting 5 boxes of 20 razors each. What does that mean? The ones you aren’t using are still staying dry and protected in their packaging and will last a long time. 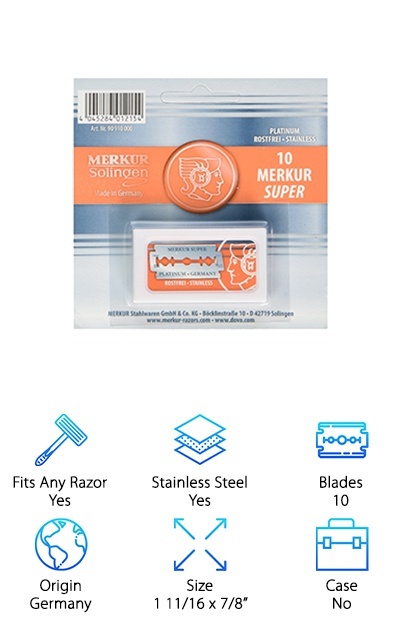 Merkur is a German company that has been making razors for over a century. We like to see brands that have a history that goes back that far. It not only means that they’ve had time to perfect their craft but that their products are good enough to stand the test of time. These double edged blades will work in any safety razor. They’re made of stainless steel and coated in platinum for a smooth shape and a sharp edge that will last a long time. When you open your pack of 10, you’ll see that each razor is individually wrapped. This keeps each blade protected from moisture while they’re in the warehouse waiting to be bought. Each blade you use is just as sharp as the first one out of the box. When we found this variety pack, we knew we had to include it. There’s nothing else quite like it out there. This is a perfect gift for someone who’s just getting into using a safety razor. Why? Because it gives you an assortment of different brands to try. Use this to see what works best for your skin and hair texture before you buy something in bulk. What brands are included? Well, you get Crystal Super +, Shark Super Chrome, Shark Stainless, Astra Platinum, Astra Stainless, 7AM Platinum, and SHARP Stainless blades. That’s a lot of variety! They’re all standard sized safety razors so you can try a different one every blade change using whatever safety razor you have at home. These blades come from all over the world, including Israel, Egypt, Russia, and Asia.